The clash of the next-best teams behind Brazil in Group E took place last night in Kaliningrad, with Serbia knowing they would be through to the last sixteen with a win. The only change in both line-ups from the first match-day was Kostic starting in place of Ljajic for Serbia. Both teams defended in a 4-4-1-1/4-4-2 shape, but Serbia were the much better team in the first-half. Their defence was extremely organised, much more so than their Swiss counter-parts. Consequently, Switzerland really struggled to build possession from Sommer in goal. The Swiss centre-backs moved wide of the penalty area when their goalkeeper had the ball. Milinkovic-Savic and Mitrovic were man-orientated to Behrami and Xhaka in the middle of the pitch, with Tadic and Kostic lurked in proximity to Switzerland’s full-backs, maintaining access. 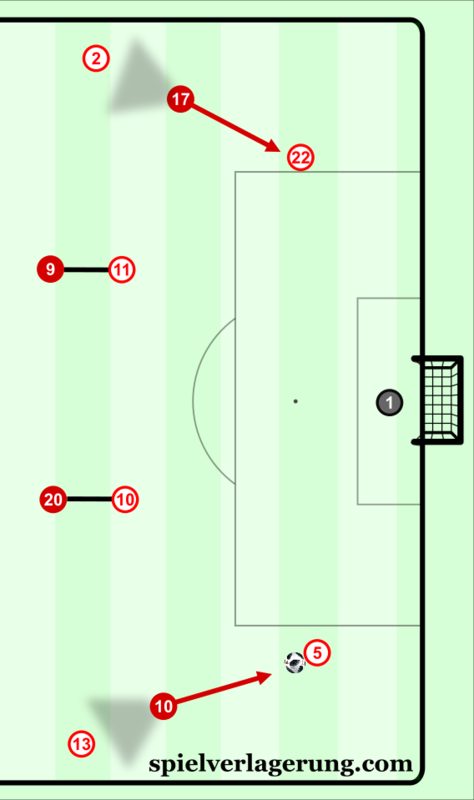 Once the open Akanji/Schar received the ball from Sommer, Serbia’s wingers, Kostic and Tadic, would press the centre-back on the ball, keeping the full-backs in their blindside, forcing a long pass forward, either by the centre-back or following a pass back to Sommer where he had no option but to do the same, resulting in Serbia regaining possession. Serbia’s attacks usually ended in crosses aiming for Mitrovic, particularly from the right side, who was dominant in the air over Schar. This was when the Serbs were at their most threatening, and was the means by which they opened the scoring after only five minutes. During Switzerland’s build-up play when they won the ball further away from their penalty area and goalkeeper, Behrami tended to split the centre-backs, with Xhaka slightly ahead. Shaqiri had freedom to roam away from the right-wing (as did Zuber on the left but to a lesser extent) sometimes slotting in to central midfield alongside Xhaka when Behrami was positioned in the defensive line. Lichtsteiner was high and wide on the right-wing, as was Rodriguez on the left. Therefore, Behrami would also temporarily operate in the right-back position to fill in for Lichtsteiner. This meant that Switzerland weren’t completely disconnected as a team on the right side. However, Switzerland were disconnected in the middle of the pitch, where there was little organisation and chemistry between Behrami and Xhaka with Switzerland’s more advanced players. Collectively, all five Swiss midfielders had too much positional freedom. Their structure in midfield was almost non-existent, meaning that players on the ball were often isolated, and Serbia’s central midfielders were unoccupied during Switzerland’s build-up, giving them a fairly easy time defending the centre of the pitch. This degree of ease was aided by Switzerland’s build-up being executed at too much of a low tempo, whilst the high work rate from the Serbians in defensive transition was also a factor in establishing a limited amount of space for Switzerland to exploit after regaining possession. The Swiss were most successful in building attacking sequences when Akanji advanced through the left half-space to combine with Xhaka, Rodriguez, and Zuber, although this usually didn’t amount to much. Schar seldom did the same as Akanji on the right, but had less success because of Shaqiri’s tendency to roam further away from the right touchline than Zuber on the left. Because of Serbia’s orientation to the position of the ball when defending, Switzerland’s attacks on the left side could have been better at breaking through Serbia’s defence with quicker ball circulation across the defensive line from right to left, creating more space on left side. If the higher tempo alone was not enough to break through Serbia’s rest defence, a possible solution would be one or two of Switzerland’s attacking players moving in the opposite direction to Serbia’s ball-orientated defence during Switzerland’s build-up circulation. This movement through the midfield’s blindside would potentially create space for Switzerland’s midfielders in the centre of the pitch, which was almost non-existent in the first-half. Switzerland came out from the half-time interval dominating possession, especially in the first 15-20 minutes of the second half, which culminated in Xhaka’s equaliser. They played much more proactively by playing at a more suitable higher tempo, and were more imposing on Serbia, who were forced to play more reactively. Gavranovic was subbed on for Seferovic at half-time, who had already done more during his first ten minutes of being on the pitch than Seferovic managed in the whole of the first-half, by moving into the channels and running in behind the defensive line. Shaqiri was more energetic, covering more ground, and operating in more intelligent positions relative to his teammates. He saw more of the ball, adding unpredictability to Switzerland’s attack. This increase in freedom and influence was aided by the introduction of Embolo for Dzemaili, moving Shaqiri to the #10 position with Embolo on the right wing. 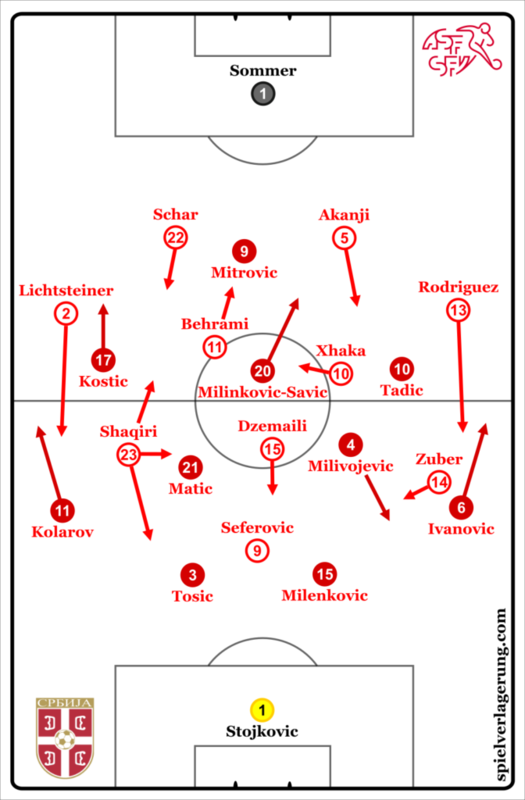 Moreover, there was too much space between Serbia’s central midfielders, Matic and Milivojevic/Radonjic, with Serbia’s defence, leaving too large of an area for Shaqiri and Embolo to receive and dribble in to, exerting major pressure onto Serbia’s defence. Serbia’s greatest threat in the second-half arose from counter-attacking situations, especially in the space on the left wing where only Lichtsteiner was left to track back from his high and wide position to cover this area. And yet, Switzerland’s two goals came from Serbia being too aggressive by trying to win the match on two separate attacking opportunities, one a corner and one a counter-attack, leaving insufficient defensive cover to stop Switzerland in attacking transition. This was a well-contested match and an even encounter. A draw would have been a fair result, but Switzerland improved greatly from their first half showing, meaning their win isn’t unjustified. They struggled to break Serbia’s organised defence down, but two Swiss counter-attacks and two moments of Serbian disorganisation were the difference between Switzerland scoring two goals as opposed to zero on the night. In the second half, Shaqiri exhibited the kind of influential role he is capable of having for Switzerland, and can pose a problem to any defence in the tournament when he’s playing at the top of his game. Switzerland can be a tough opponent for the best teams in the tournament to play against, as the 1-1 draw against Brazil showed, and they shouldn’t be discounted in their last-sixteen match should they progress, especially if Petkovic addresses their attacking structural shortcomings that persisted in the first-half. Serbia should have been awarded a second-half penalty after the referee didn’t see two players holding Mitrovic down, which was a failure of VAR. Nevertheless, it is still all to play for in Group E. Switzerland are level atop the group on four points with Brazil, and are now in a superior position than Serbia on three points to qualify for the knockout stages. Switzerland will have to play against a well-organised Costa Rican team on the final match-day, whilst Serbia are faced with the task of having to get a result against Brazil to have any chance of qualifying.